12/2/2014 - AHF sponsors Forum on on US - Hungarian Relations hosted by sister foundation in Hungary the Amerikaiak a Magyarokért Alapítvány (AMKA or Americans for Hungarians Foundation): Panel participants included André Goodfriend, the Charge d'Affaires of the US embassy; Frank Koszorus Jr. the President of American Hungarian Federation; Dr. Lomnici Zoltán the spokesperson of the Civil Összefogás Fórum (CÖF); Hejj Tibor, the President of P-M-C Consulting who has sponsored many charity projects; and Gyula (Jules) Balogh, President of the Amerikaiak a Magyarokért Alapítvány. AMKA hosted the forum as part of its 5th anniversary celebration on November 26th, coinciding with Thanksgiving, at the Danubius Hotel Flamenco in Budapest. 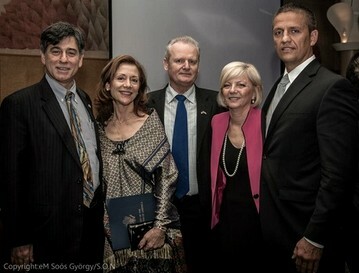 Over 200 guests attended including Prof. Dr. Horváth János former doyen of parliament and his wife Linda; Dr. Réka Szemerkényi the next Hungarian Ambassador to the United States; Katalin Csorba representing the Hungarian Foreign Ministry; Col. Zoltán Boné former Defense Attaché of the Embassy of Hungary in Washington DC; and Sándor Herpai, Architect featured at the 2013 Smithsonian Folk Life Festival in Washington, DC. 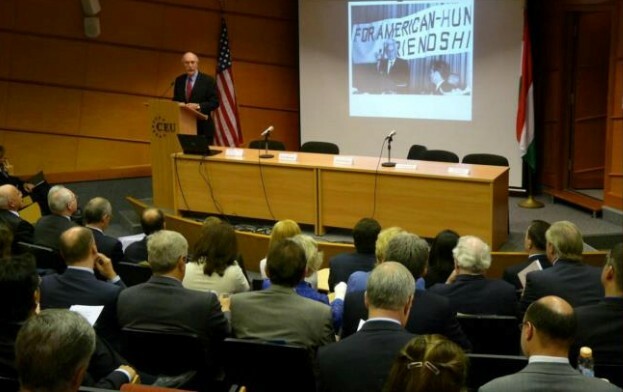 The Forum was the first in a series to be held to address the hoped-for restoration of the excellent relations that the United States has had with Hungary for many years, but which has been deteriorating recently. This first of a kind forum brought together parties holding differing views on the political landscape of Hungary and the bilateral relations between the two natural allies. The purpose of the FORUM was to candidly exchange ideas and better understand these various perspectives. 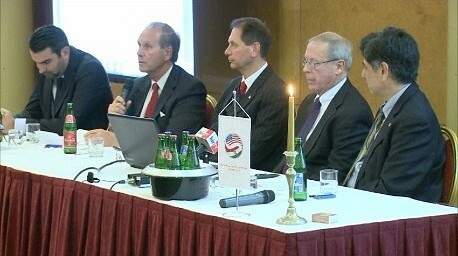 Left to right: Dr. Zoltán Lomnici, Frank Koszorus, Héjj Tibor, Gyula Balogh, and André Goodfriend. 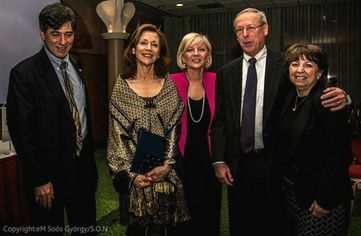 The participants (seen here) included the U.S. Charge d'Affaires André Goodfriend, Dr. Lomnici Zoltán, Jr., the spokesperson of the Civil Összefogás Forum (CÖF), American Hungarian Federation President Frank Koszorus, Jr., Mr. Héjj Tibor President of Proactive Management Consulting, and Mr. (Jules) Gyula Balogh President of the Amerikaiak a Magyarokért Alapítvány. All of the participants had experience working or being educated in the United States. The event opened with a very moving Thanksgiving celebration where Americans, Hungarians and American Hungarians gave thanks for what they had received over the past year and reflected on the bonds that tie Americans and Hungarians together. Dr. Zsuzsanna Dreisziger, AMKA Co-President, delivered welcoming remarks [watch video ]. The FORUM started with observations by the participants of what was good about America and Hungary, as viewed by both sides. Dr. Lomnici described his wonderful 6 years in the U.S. at the NIH where he had a grant to study issues relating to tobacco. Mr. Hejj described his obtaining his MBA in the U.S. where he went with his family and 4 children. He experienced the hospitality of the people and friendships with professors, the educational system, the honesty of the students, even the wonderful nursery for his children. He also talked about how friendly and accepting the students were to a youth who was disabled. Mr. Koszorus spoke about the freedoms andopportunities provided to all in the U.S. to succeed, and the tremendous benefits citizenship provides. Mr. Balogh spoke about coming to the U.S. at age 7 and how his mother said that you must always keep your Hungarian heart, but you are now an American. He talked about America's' willingness to help other people and its entrepreneurial spirit.He also said that Hungary is a magical land, like Disneyworld, charming with wonderful people and a beautiful countryside. 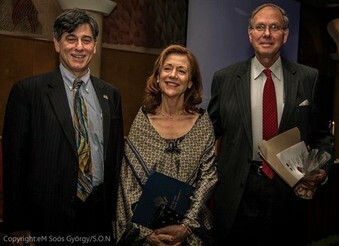 Mr. Goodfriend said that the U.S. and Hungary had many things in common. The U.S. has accepted people from diverse lands and that acceptance is one of the great strengths of America. Hungary in the past has also been very accepting of other peoples. "Nagyon csodalkoztunk a U.S. kormanyzatanak ezen a legujabb intezkedesen. Obama elnoknek is valakik rossz tanacsot adhattak es a mostani beutazasi ugy kapcsan pedig megdobbentunk. Ezt ugy fogtam fol, mint amely az egesz magyar nemzet ellen iranyul. Eppen azert, mert nyilvanosan kozoltek, de megsem mondjak meg pontosan, mirol van szo es kiket erint. Ilyet nem szabad tenniuk, mert ezzel besarozzak az egesz becsuletunket. Rank nezve nagyon megalazo, amit az amerikai kormanyzat tett. Mi magyarok ilyen durva dolgot nem tennenk meg az amerikai emberekkel!" 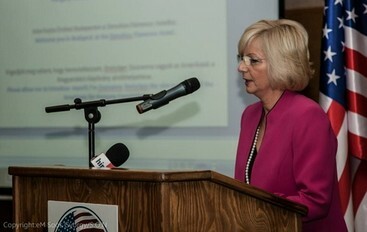 The FORUM then moved to a discussion of the concerns that Hungarians and American Hungarians had with the U.S. government’s approach to Hungary and the issues the U.S. government had with Hungary. 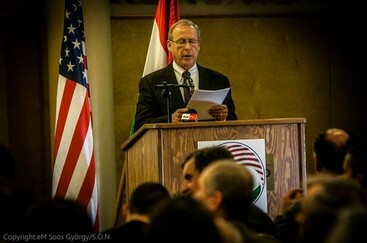 Mr. Koszorus, who also represented the Federation at the Hungarian Diaspora Committee meeting earlier that week, read a moving letter from an apolitical professor in Hungary who is a friend of the United States but who reiterated the perception that the U.S. was demeaning and humiliating the Hungarian people with its overwhelming and public criticism, much of which was overstated or lacked proof. Dr. Lomnici described some of the problems in the U.S., such as discrimination and corruption, implying that the U.S. may not have much standing to criticize others. He also mentioned that the U.S. did not help Hungary in 1956 and that was a sore point among Hungarians. Mr. Héjj, among other things, mentioned that Hungary has been historically surrounded by conflict from other countries and that Hungarians often have had to fend for themselves, such as in 1956. They therefore are very sensitive about their sovereignty. He said that Americans need to understand this when they involve themselves in the internal workings of Hungary. Mr. Balogh put forth the question of why the U.S. only criticizes conservative governments. Mr. Goodfriend had many good things to say about Hungary, including the friendliness of the people and acknowledged Hungary is a democracy. He also indicated that he had an issue with the formulation of the latter question, since he felt that the U.S. approach was not criticism of one party but a dialogue about what the embassy observed in Hungary. The final question asked how to solve the issues between the two countries. 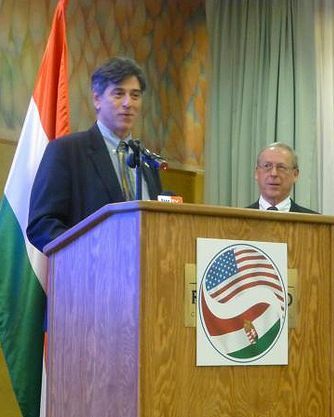 There was agreement that enhanced exchange programs highlighting both cultures, student exchange programs, cooperation in research, improved trade, taking sensitive discussions behind closed doors, and both governments being proactive on improving relations would go a long way to removing the strain between the U.S. and Hungary. 5/11/2012 - Budapest’s Central European University hosted a one-day conference to mark the 90th anniversary of diplomatic relations between Hungary and the United States on May 9th. The conference, co-organized by the Ministry of Foreign Affairs and the US Embassy in Budapest, was opened by Hungarian Foreign Minister Janos Martonyi and US Deputy Assistant Secretary of State for European Affairs Bay Fang [read more].